Saturday morning. A time for sleeping in. Or, in Seth's world, a time for getting up at 8:30 EST. I'm not sure why exactly I can't sleep in, I suppose my internal clock is WAY too fine-tuned and bossy. Either way, I was awake and ready to do more New Yorking. After lounging around and watching some TV, I decided to get up, shower and start roaming around. To my surprise, the WiFi in the hotel was actually working... for about 10 minutes. So instead of barricading myself inside all day, I decided to take a commenter's advice and check out the free WiFi in Bryant Park. I was not disappointed. Bryant Park is beautiful. It's nestled inside the city and sits right next to the New York Public Library. For a park that's only as big as a block, it's extremely quiet and relaxing. I also took the commenter's advice and had a PB&J from ’wichcraft, which was delicious. While chowing down on my ’wich, I posted yesterday's entry and then geeked out heavily by continuing to read the Transformers movie prequel novel – which is a decent read. After spending a few hours in the park, I headed back to the hotel and planned my evening. I was to head up to Harlem around 6ish for dinner with Thomas, Danny and Kristen. But before that, I decided to watch Training Day and work out at the hotel. He wasn't kidding. After eating a huge plate of pulled pork, mashed potatoes and baked beans (my attempt at ordering the waffle failed... yes, waffle), we chilled at Thomas’ and then decided to head back downtown to Chelsea for a drink at Trailer Park Lounge & Grill. While Danny and I were enjoying our Pork Slap Pale Ales, poor Thomas was really wanting dessert. While excited that Trailer Park had Moonpies, they didn't have the banana variety, so it was a no-go. Instead, when we left the bar, we walked next door to Burgers & Cupcakes, where they have burgers, cupcakes and burger salads. All three of us got a cupcake (Kristen had left for home to feed Buckley) and sat on the sidewalk in Chelsea enjoying their overly richness. It wasn't late, but I was exhausted. I love walking around in NY, but I think yesterday got the best of me. I slept like a rock. Today's my last half-day here. I leave at 7:45 tonight and plan to do a little window shopping today. I'm back in Bryant Park and just enjoyed another ’wich from ’wichcraft. I'll probably read more of my book, too. Oh, but on the way here, I saw a photo shoot (for a print ad, maybe) and I saw the filming of a low-budget film. It's also Puerto Rican Day in New York. Only a few hours until I catch my cab. Le sigh. Don't forget that thomas ranked the "cupcakes on the sidewalk" adventure as one of his top 10 moments in nyc, and seeing as how he's left harlem 11 times, we should all feel privileged. How could I forget such a provocative statement? Gah! We basically made NY cool that night for Thomas. 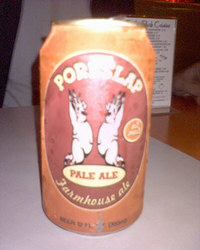 I thought that can of beer said "Pore Slap" like they were slapping their skin (and pores) together. Sounds like a ghetto term for doin' it.